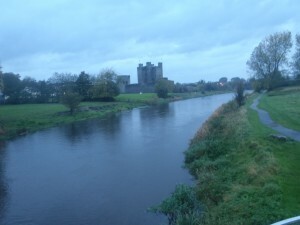 The day began with a 10 km run along the Boyne River Castle Walkway behind Trim Castle for me and a power-walk for Arthur throughout downtown Trim. Miraculously, the early morning began with a clear sky so we thoroughly took advantage of this. The ‘Castle River Walkway’ followed the Boyne River westwards with the river path being a 5km route through fields that were scattered with sheep who took it upon themsleves to stroll along the walkway, undeterred by any runners who managed to pass them by. At the end of the 5k pathway, I came upon the rather spectacular ruins of ‘Newtrim Cathedral’ and after circling the graveyard a few times, I headed back towards Trim Castle (yes, through the flocks of meandering sheep), where at the very other end of the pathway were more church ruins with a sign, ‘Newtrim Cathedral’. I must look into this. It’s either a very long 5km former cathedral or the signage is made to make tourists, such as myself, confused. Returning to the Castle Trim Hotel, it was breakfast time and then time to drive to our early afternoon show in the north end of Dublin. We got to St. Joey’s Catholic Boys School in an hour (the rain of course had restarted! ), and were made to feel most welcome. We had performed at this school six years ago on our last tour and it was delightful to see principal, Padraig O’Fainin, again. Frank, the custodian, insisted on tea and treat time before we started our show and we had a wonderful visit before unloading our instruments and equipment and tuning up to start our show. It was very boisterous group of 140 boys ages 5-10 and before we knew it, we were saying our good-byes and loading up to head back for Trim in yes, the pouring rain. 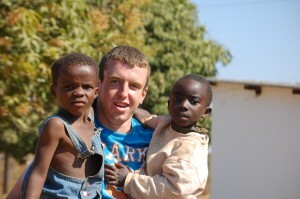 It was most interesting to hear from Padraig that this week he was heading over to Kabwe, Zambia to spend some time on a project that he and others at St. Joseph’s Primary and Secondary Catholic Boys schools had set up 3 1/2 years ago: a project providing the town with water, education and care for street children of the area. Padraig is an amazing man with his energy for his St. Joey’s CB School in north Dublin as well as for his international vision and work for the care and education of the less fortunate. We so admire Padraig and wish him and others at St. Joey’s all the best! !